When you think of Sapphire, the platform that mostly comes to mind is AMD. This is probably because Sapphire is the largest company producing and distributing ATI products. Now, however, we may be looking at an entirely different ball game. With the introduction of the Pure Black x58 and the x67 boards, Sapphire seems to going straight for the Intel market and is not holding back. 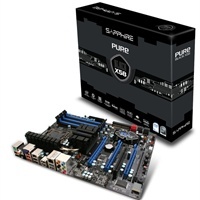 Just from one look at the Pure Black black motherboard one can already tell that this product was specifically designed and aimed at enthusiasts and gamers. This sort of late introduction into the market on the x58 platform along with its high-end price tag and specs could place the board into a “dark horse” category. But the real question is: does it have what it takes to take a spot in the lead or will it be shoved aside as another imitation? We decided to find out.